This innovative planter makes it easier than ever to surround your home with lush, colorful plants. The patented design includes sturdy brackets that easily adjust to fit railings from 1" to 4-1/4" wide. Simply lock the support arm to the desired width, hang the planter, then fill with your favorite flowers or herbs. No tools, mounting hardware or drilling required. A hidden adjustable support bar keeps planter level. 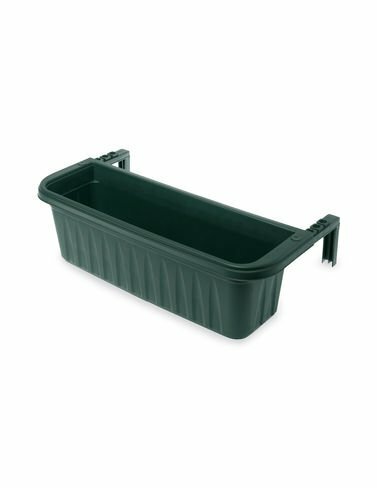 A fast, easy and secure way to add flower boxes to railings along a deck or balcony, or bring color to fences. The evaporative grid self-watering system with 1-quart reservoir helps keep plants healthy and lets you water less often. Not suitable for round railings.